It was a rainy and cold Tuesday when this Jezebel staffer left the Gawker Media office on the mission: to find a Teavana® Oprah Chai Tea Latte, now available at a Starbucks near you. The mission was successful and we can now report that it left us feeling both fantastic and slightly insane. Oprah is an unabashed chai tea lover. If you are an unabashed watcher of OWN, you may have enjoyed this video where Oprah explains how calming her ritual of making chai tea at home is to her. "Beep beep, steeping my soul," Oprahbot says as she brews her tea, one of many interesting noises she lets come out of her body. Perhaps because Oprah loves chai so much, she and the tea company Teavana teamed up to created her own personal blend of the stuff. What makes Oprah's chai so special? She says that they "got the cinnamon mixture just right so that you don't need sugar." Going into a Starbucks stresses me out, so I was overly concerned that when I got there it wouldn't be clear to me what to order. I shouldn't have worried my pretty little head about that: at the top of the menu was a carefully labeled OPRAH TEAVANA CHAI on a special green background. A tall OPRAH TEAVANA CHAI costs $3.75. 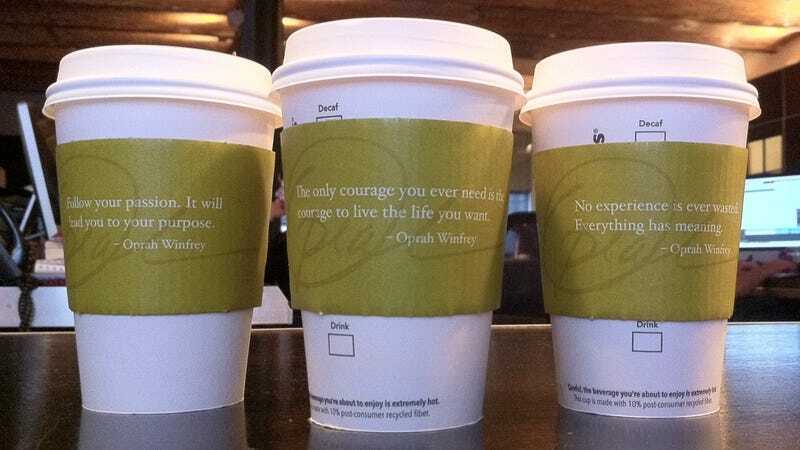 Each one comes with a coffee sleeve with your own personal Oprah quote on it. I bought three, one for myself ("The only courage you ever need is the courage to live the life you want") and my two fellow chai virgin coworkers, Dodai ("No experience is ever wasted. Everything has meaning") and Tracie ("Follow your passion. It will lead you to your purpose"). Unfortunately, the specialness of the chai did not overcome the total unspecialness that is purchasing something at Starbucks. It took me a few minutes to realize that the barista was not going to call my name and was not going to specify that the chais that were ready were Teavana® Oprah Chai Tea Lattes for Kate, Chai Tea Virgin. I kept this complaint to myself, however, because I didn't want anything to further interfere with the important Steeping of the Soul process. Though I was almost run over by two cars on my way back to the office and the wind was picking up enough to worry a tornado was on the way, the fact that I made it off the streets sans injury was definitely due to the healing power of the chai. Final Verdict: one sip of a Teavana® Oprah Chai Tea Latte and you are Oprah'd away to a magical planet where strangers pass each other on the street and say "Steep Your Soul, friend." Dodai, Tracie and I all found it to be very, very tasty, much like what Christmas would taste like if Christmas didn't already have a drink (egg nog). Further observations from my fellow chai virgins confirmed that this stuff is great. Tracie: What's chai? It's like a leaf or something? [Googles "chai"] Oh chai just means "tea" in many cultures. Dodai: I might be feeling this in my soul. I did really knock that back super fast. I'm just going to breathe. I feel a little jacked up. [10 minutes later] I can feel the crash coming. Note: After researching, test subjects found that a Tall Teavana® Oprah Chai Tea Latte has 40 mg of caffeine in it. There are 34 mg in a 12 oz can of Coke. I can report that immediately after a cup of Teavana Oprah Chai I felt remarkably better than I had 20 minutes prior. Of course, 20 minutes prior I had been battling my way through one of the busiest Starbucks in New York City wondering how I could be watching someone buy an chai frappuccino in this weather and considering whether it was appropriate to let to the girl in front of me know that Oprah would not approve of her choice to stand right in the middle of the checkout line on her phone if she wasn't actually trying to buy something. An hour after the chai was purchased and consumed in about five minutes flat, my body didn't know whether it was tired or exhilarated. But seeing as this is probably what it feels like to actually hang out with Oprah, three out of three Jezebel staffers say INSERT CHAI TEA EMOJI AND A THUMBS UP EMOJI to a Teavana® Oprah Chai Tea Latte. Money from the sales of the Teavana® Oprah Chai Tea will go to charity or something.